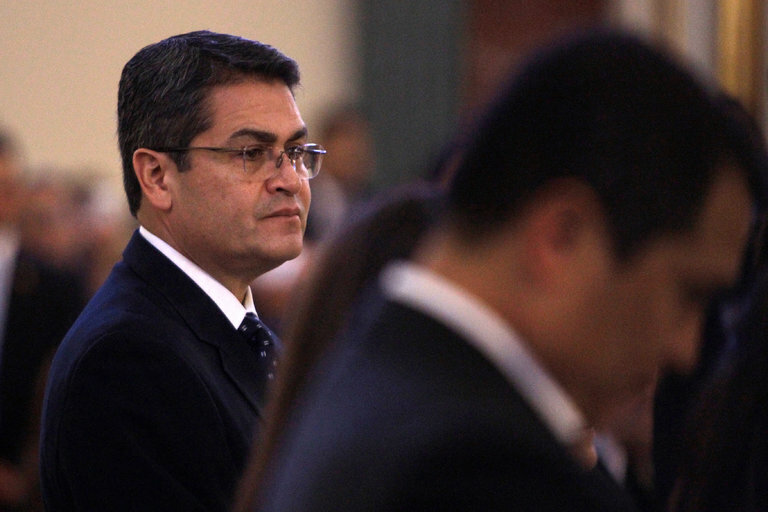 President Juan Orlando Hernández called for “national understanding” on Tuesday. MEXICO CITY — The United States appears to have thrown its weight behind President Juan Orlando Hernández of Honduras, who was declared the winner of last month’s disputed election, ignoring a call from the Organization of American States for a repeat of the voting. Mr. Nasralla amplified the O.A.S. recommendations for a new election during a two-day trip to Washington. Speaking to reporters, he urged other countries not to recognize Mr. Hernández as the winner of the election and to suspend aid to the Honduran government until a new vote is negotiated. “In the exercise of democracy, a candidate cannot ignore the O.A.S.,” he said. Although Washington has yet to recognize Mr. Hernández as the winner of the election, the State Department said in a statement on Monday that “the United States notes that Honduras’ Supreme Electoral Tribunal has declared incumbent president Juan Orlando Hernández the winner” of the election. In its statement, the State Department called on the opposition to file its complaints with the electoral authorities. The Honduran electoral commission, which is controlled by allies of Mr. Hernández, said Sunday that Mr. Hernández had won the election by a margin of about 50,000 votes. But an electoral observer mission from the O.A.S. said that the vote count showed so many irregularities, including a statistically improbable swing toward Mr. Hernández as the final third of the ballots were counted, that the result could not be verified. 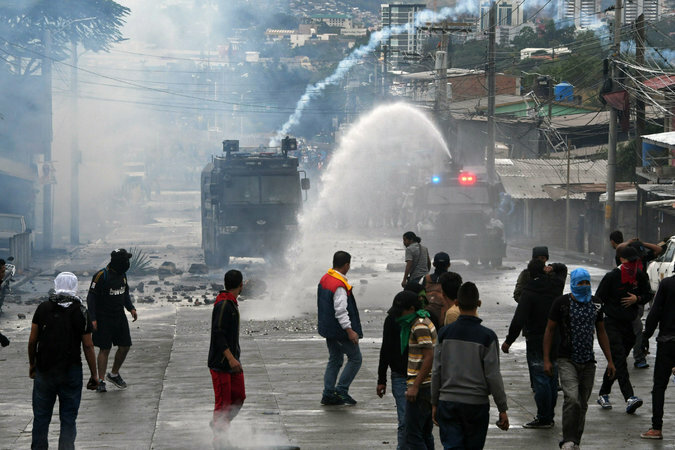 The police used tear gas and a water cannon on Monday to disperse the supporters of Salvador Nasralla during protests in Tegucigalpa. Secretary General Luis Almagro of the O.A.S. then called for Honduras to hold a new election. Several lawmakers in the United States have supported Mr. Almagro’s position. “Given the O.A.S.’s leadership role in the hemisphere, I support their call for a new general election,” Senator Tim Kaine, a Democrat from Virginia, said Tuesday in a statement.